We started our retreat on the February 14, 2015, with Sr. Agrippina Ashipala, OSB as our facilitator. She said that a retreat is a turning over of our own selves and past life to God. Prayer and silence work together. If a person is not silent, she cannot pray. Our good works will never replace prayer. Sr. Agrippina gave us texts from the bible for our reflection. We concluded our retreat by asking Mother Mary to be our role model and resolving to be faithful to our vocation. On February 21, 2015, all the Sisters and formation members gathered in the Chapter Room to witness our admission into the Novitiate. Mother Mary Thomas Prado, OSB said that the responsibility is in the hand of the community to form us as new novices in the Benedictine way of life. She continued by saying that the community must not fail us. The good example they give us today will be the example we will give to those who will come after us. Their good example will also be the seeds for the future of our priory and the congregation. To us new novices, Mother Mary Thomas said that our responsibility is to live according to the Benedictine values, to live under a superior and to persevere in this way of life. Again she said that the veil is a visible sign of our calling, but not a sign that our life will become easier or that we will do whatever we want or what we like. Furthermore, the veil, Our Constitutions and Holy Rule will bring us not to a rosy garden but will bring us to the cross, to a life of total self-giving to let God be God in our lives. They will bring us to the fullness of who we are and to that deep and lasting joy that the world will never be able to give nor an amount of success, pleasure, or comfort we can provide. 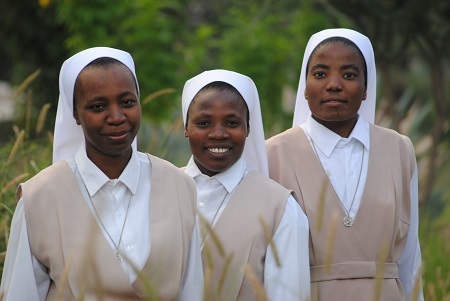 We are blessed to be in this stage of religious formation on this Year of the Consecrated Life. May God complete what He has begun in us. Thank you and kindly accompany us with your prayers.